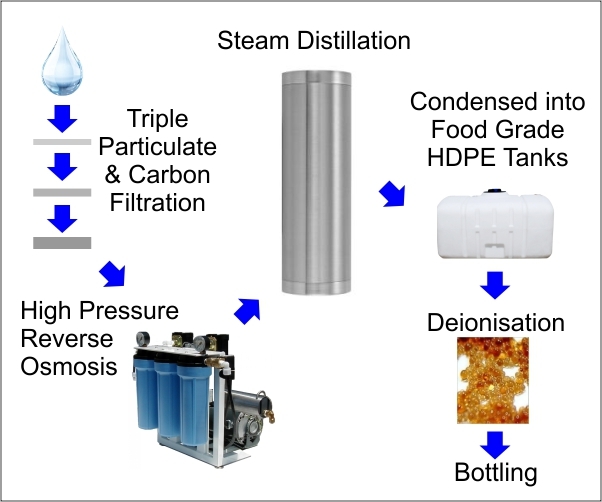 We are a trusted, UK producer/supplier of Ultra Pure Steam Distilled Water and rapidly becoming one of the UK's top producers of Distilled Water. Our quality distilled water is used in an enormous range of industries from research, pharmaceutical, motor-racing, automotive and electronic industries to distillers of spirits, cosmetics manufacturers, forensics and radiotherapy. We also take pride in supplying our pure distilled water, directly to members of the public for appliances such as steam irons, sauna steam generators, nebulisers, humidifiers, topping-up car batteries and other niche applications such as making colloidal silver and vinyl LP cleaning. We aim to provide a world class service so that our customers can buy distilled water from us with confidence. Our feed water is filtered three times and forced through a reverse osmosis membrane at very high pressure to create a superior starting water, often below 10ppm to start with! This feed water is then boiled and the resultant steam is cooled, collected, filtered through activated carbon and finally ion-exchange resin (mixed bed) to sequester the last remaining ions. The distilled water is then placed into brand new, clean, food-grade HDPE bottles, all at our Northamptonshire based site. We have been proudly distilling water since 2008 and have improved on existing technologies to create our own bespoke, advanced stainless steel distilling machines. We are currently selling thousands of litres each week. Our water is 100% distilled and not just filtered or deionised as we have seen being passed off by some other companies. The impurities of filtered water can be over 20 times higher than that of distilled water as filtration is an inferior practice that does not remove the dissolved impurities, heavy metals and bacteria. Filtering is also hugely wasteful, with large volumes of drinking water being lost down the drain during processing. 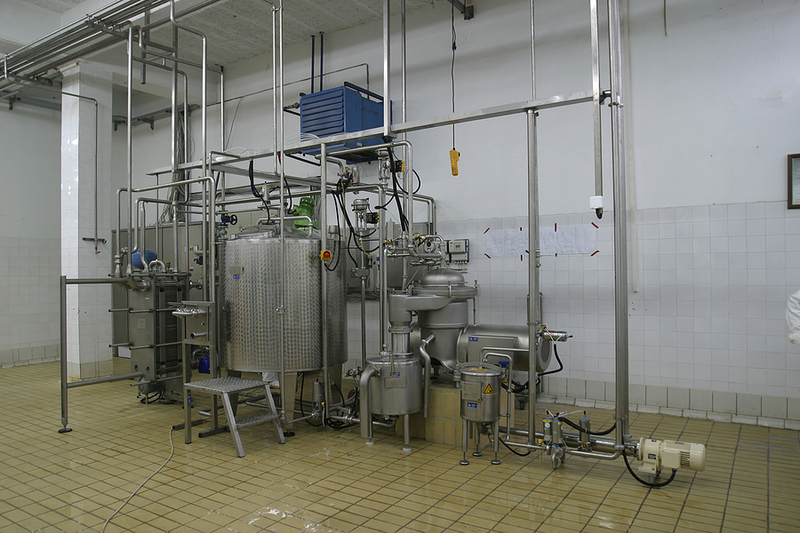 The modifications that we have made to our distillers over the years mean that our units operate extremely efficiently with very little water being wasted and waste heat from the process even heats our offices! When you buy distilled water from us you can be assured that we take our environmental responsibilities seriously. Guaranteed Purity: We are so confident about the purity of our distilled water that if you find that the water we provide is any less than 99.9995% pure (5ppm), we will give you a full 100% refund. Guaranteed Satisfaction: If you are not 100% satisfied with your order upon receipt, simply return it to us within 7 days and receive a full, 100% refund. After you buy distilled water from us, it should be kept sealed since exposure to atmospheric carbon dioxide will affect its conductivity and purity. The distilled water should be stored away from direct sunlight and be kept at temperatures of between 15-25 degrees C. You can buy distilled water from us in 500ml, 1 litre, 5 litre and 25 litre containers but we are flexible and requests for different volumes or container types can be accommodated. We also offer attractive discounts for repeat orders and customers who buy distilled water in bulk. Please contact us for further details.